So the world is continuing to go nuts--and it's like everyone is behaving like Negan from The Walking Dead! 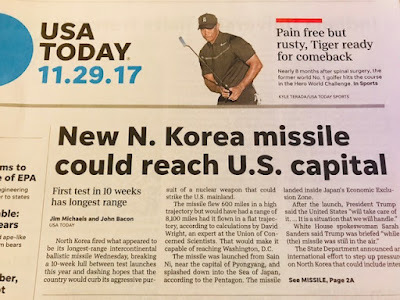 North Korea has achieved ICBM capability with a missile launch yesterday to 2,800 miles altitude—11 times higher than the International Space Station—giving Axis of Evil, North Korea the ability to now hit Washington, D.C.! At the same time, a career civil servant tries to pull a fast one on the Trump Administration—challenging the President’s right to appoint an Acting Director over the Consumer Finance Protection Bureau, which is part of the Executive Branch of government—and hoping that the Senate then won’t confirm Trump’s new appointee for Director, all of which would leave her in charge of CFPB for the next 3 years! Of course, the courts don’t see it her way, but as the Wall Street Journal noted her coup attempt is definitely something to take note of in democratic, America. In the background, the Democrats and Republicans continue to beat each other silly and senseless, and not only with stalled legislation on almost every front from Healthcare to Immigration, but now minority leaders Schumer and Pelosi are even refusing to meet with the President over enacting a government budget leading us to another looming government shutdown in December…we can’t seem to keep the government functional or even running for the most powerful nation on Earth. Finally, Bitcoin—an artificial computer-generated currency, advanced 1,000-fold this year to hit $10,000! Talking about another financial bubble reminiscent of the manic investment in tulips in the 17th century. What’s the value of Bitcoin or sunflowers? Whatever you want it to be! It’s not about the technology, which may be great, but rather the phony valuing of cryptocurrency, which few understand, and we all know how these bubbles end. 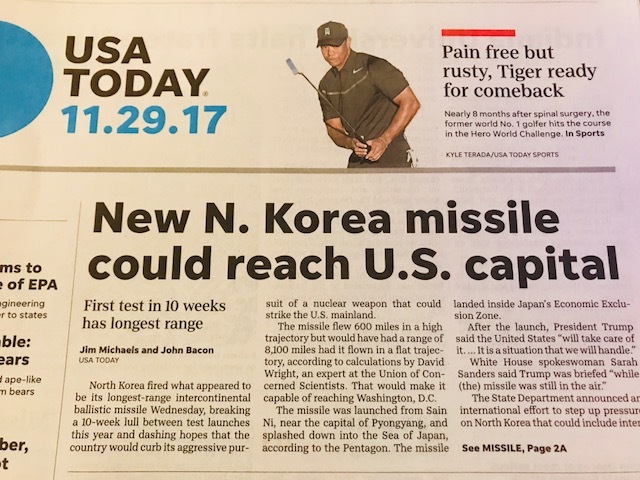 So overall, we have national security, the administration of our government, and economic stability all in grossly abnormal territory.